"The recipes are tasty and I lost 11 pounds." 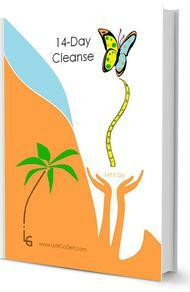 Are you ready for a body cleansing transformation? We are excited to bring you our body cleansing programs which combine clean eating, smoothies and juicing. Are you feeling tired and drained? Are your pants fitting a little too tight? Do you want to feel revitalized? Then it's time to take you body on a vacation! Take your body on vacation from pollutants, pesticides, food additives, artificial sweeteners and other processed foods. The processed foods that are found in the typical American diet can make you feel sluggish, lower your immune system and slow your metabolism. If your body is calling for a change, then you are ready for a body vacation. Try one of our cleansing programs today! Our programs can be achieved in the comfort of your own home with food bought locally at your grocery store. We provide the shopping lists, recipes and meal plans. All you have to do, is follow one of our programs, and you will feel the best you have felt in years! It's time to find you! Are you ready for a body transformation? Recognize emotional eating; we all do this. Let it Go! Ease or rid all pain! Enjoy the use of fresh ingredients - not toxic foods!